*Please note: there will be a VERY limited amount of ARCs for ESCAPING FROM HOUDINI, but i will be hosting giveaways on my social media accounts. not all requests will get a response due to the volume, but please rest assured they have been received. Heather Baror-Shapiro, Baror International, Inc.
*Please note: I am legally unable to read or critique or offer any advice on your manuscript. Boo! I know 😦 But! I do have a wonderful page dedicated to writing resources that I swear by, and will send you a bunch of good querying and writing vibes. Unfortunately, if you write to me about your book, I will be unable to respond. Also, when I’m on deadline it takes much, much, much longer for me to respond (weeks, months, etc). I hate that, but it’s important to work on getting more books in your hands, and making them the very best they can be. Know that I love and appreciate and feel so darn honored that you took some of your precious time to write to me. You are incredible. If you’re interested in writing advice, please see the ‘For Writers’ tab on my website or click on this easy link here —> Here’s the page of writing resources. I’ll have a limited amount of ARCs that will be raffled off through giveaways/contests on both my blog and others. I will post about all contests and opportunities to win an ARC on my blog, twitter, Instagram, Facebook, and other social media accounts. I wish I could grant all your ARC wishes! Know that I’m hugging you and sending you sparkly hearts. You’re the best! Any review requests/ARCs can be made by contacting Erinn McGrath at: Erinn[dot]McGrath[at]hbgusa[dot]com but due to the large volume of requests, not every email can be responded to. I can’t link them, but they pop up with a google search. Hope that helps! Can you tell me where to purchase the various book shelves that you have posted? If you click on the individual pictures for the bookshelves you’re interested in, it should take you directly to the websites. Happy shopping! Hey. I have a perfect idea for one of your books! Another adventure for Audrey and Thomas. Imagine them going to France and figure out there’s a murder. Not just any one that is haunting this old opera theater. They have to stay in the opera theater due to some school lessons. They soon find a secret chamber in a mirror leading to a lair. Not just any lair it’s the Phantom of the Operas lair. Will they soon figure out there are heirs to the phantom or the phantom is putting trances on Audrey like Christine? The phantom could like be trying to get Audrey even though she already can get out. And they try to figure out how people die from a lasso around neck. So what do you think? It’s just an idea but I feel like you should do something phantom since it seems like it fits your writing. Thanks! I’m also a huge fan of your work! My friend got me hooked the other day and my school librarian said she will order two copies of Houdini. Can you tell me when the audio version will be available I love listening while I’m working. Can i pleaseeee get an arc copy of either of your books? Please…. Hi! I love the historical figures that you use and I was wondering if you have plans to use more of them in any future series? I love reading these kinds of books and it’s really rare and interesting to find an author that thinks of the less romanticized characters. Will future book series have more of these original and realistic storylines? Hi, is there a newsletter I can sign up for? I’m so excited for Escaping From Houdini!!! Hi Kerri, my best friend loves you and your work SO much!! She reads your books all the time and loves them! 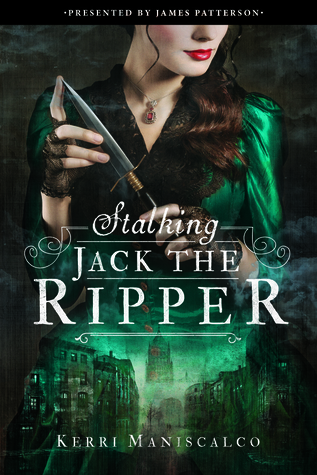 Stalking Jack the Ripper was one of her favorites. I was hoping to get your attention so that maybe you could send me a video of you saying “Merry Christmas” to her, because that would make her Christmas even better! Please email me back if you see this and are willing to make the video!